got to make the call. it was a foul. Horrible way to lose. got to make the call. It was a double dribble. Horrible way to lose. CDawson - It was a foul (and, admittedly by Bruce Pearl, an intentional foul) before the double dribble when the Auburn player grabbed his jersey. Horrible way to lose, but we could play this game all day. @ CDawson: And you called the double dribble the second it happened right? No, you missed it like most everyone else did too. Seems like a smart kid, I like how he handled that. May have been a foul but a ticky tac call. 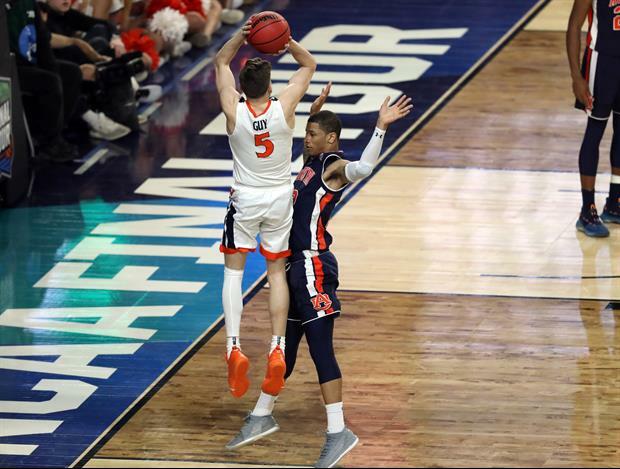 The offensive player, once he leaves his feet, must be given room to come down and, as is clear in the replay, the defensive player stepped forward creating contact when the shooter returned to the floor. So, yes, it was a foul and the correct call. But it was the double dribble that WASN'T called that was the real game changer. After the kid dribbled the ball off his foot, he could have continued his dribble had he only used one hand to do so. But when he picked up the ball with both hands, his dribble ended. At that point, he could only pass or shoot. He could not start another dribble. So it was a missed violation that would have given the ball back to Auburn which would have assured them the win. Very nice messages from player and parents. He just got a little too close. Basketball is a physical sport but if we are allowed to touch the player while they’re shooting no one would ever score.